ATTENTION! 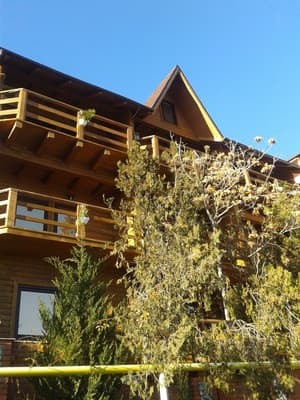 A discount of 10% is given, with early booking. 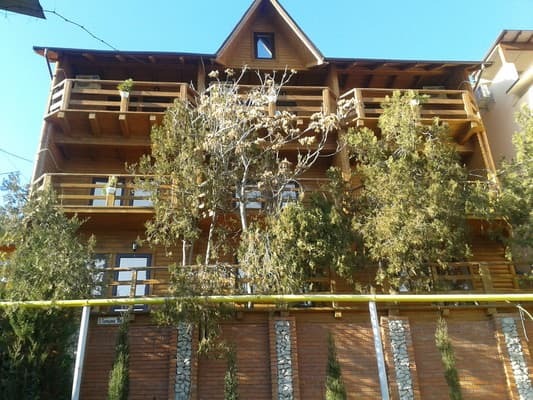 The hotel "Three plus Two" is located in the park area of ​​the village of Novy Svet. The building is made of environmentally friendly material - wood (smereka). Rooms are equipped with modern furniture, balconies and terraces are woven rattan. The hotel has 12 single rooms, dining room, laundry. There is free Wi-Fi throughout. In walking distance are shops, a market, children's and sports grounds, a guarded parking lot, a museum and a church. Distance to the sea 350 meters (7 minutes walk), free beach in the village. From the balconies of the second and third floors, there is a beautiful view of the sea and mountains. On the terrace of the first floor, relic junipers grow. The hotel rooms are daily cleaned, towels and bed linen are changed. Breakfast is included in the price. There is a possibility to book walking tours (for hotel guests - 20% discount). Transfer is available upon request. PRICES MAY CHANGE, IT IS REQUIRED TO RECEIVE INFORMATION FROM THE OPERATOR. 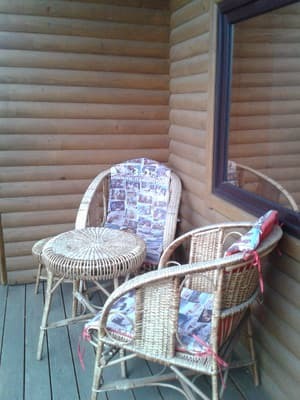 Description of the room: One-room rooms in wooden decoration with a common terrace with cozy rattan tables and armchairs. Rooms of this category are located on the 1st floor. The area of ​​the room is about 30 sq.m., which made it possible to comfortably accommodate a large double bed and two single beds. The room is equipped with modern furniture. There is air conditioning, refrigerator, TV, safe, wardrobe, mirror, bedside tables, electric kettle. Description of the room: One room with balcony is located on the 2 nd floor. 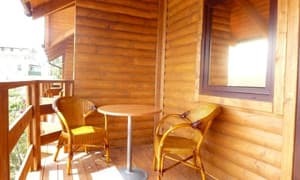 A special interior is given by a wooden decoration and a cozy balcony overlooking the sea and rattan chairs. 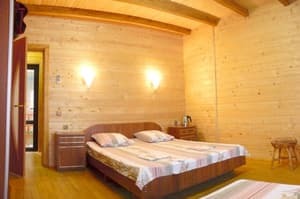 The room is equipped with modern furniture: a large double bed and one single, bedside tables. There is air conditioning, refrigerator, TV, safe, wardrobe, mirror, electric kettle. Room size is 19 sq.m. The area of ​​the balconies is 8 sq.m. 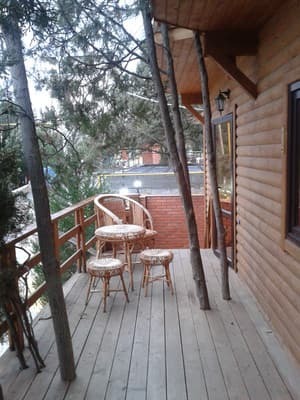 Description of the room: Compact one-room 2-bed rooms of improved equipment are located on the 3rd floor, from balconies which offers an unforgettable panoramic view of the sea, the bay of the Novy Svet village and a juniper grove. 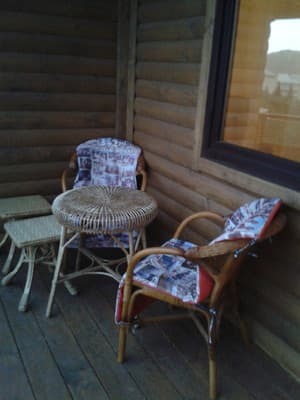 On the balcony there are cozy rattan chairs, a table. 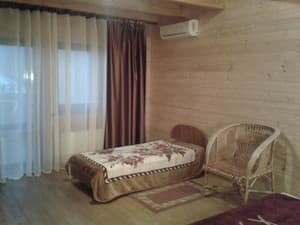 The room has leather furniture: a large double bed and a sofa (1.2 meters long). There is air conditioning, refrigerator, TV, safe, wardrobe, mirror, electric kettle. Bathroom: shower, sink, toilet. The area of ​​the rooms is 19 sq.m., the area of ​​the balcony is 8 sq.m. Children aged 2 to 5 years on the extra bed - 45 UAH / day. The cost of accommodation for adults to specify at the time of booking. The village of Novy Svet is located at a distance of 6 km from Sudak. The village is a botanical reserve. The hotel is located in a quiet center. To the bus station - 50 m, to the beach - 350 m, to the shops and the market - 100 m. Distance to Sudak - 8.5 km, to Simferopol - 126 km, to Feodosia - 86 km. From Simferopol and Feodosia by bus and shuttle. You can book a transfer at the hotel.